Compliantly store your NFPA hazardous material storage with compatible chemical groups. NFPA 704 is a standard that is maintained by the National Fire Protection Association. The classifications stated, defines a detailed image that is used by emergency personnel, and the general public to quickly identify the risks posed by the presence of hazardous materials that are stored in a hazardous material storage container or chemical storage building. Objectives of the NFPA hazardous material storage system is to provide a clear image of what type of risk is presented in a certain facility, to assist planning for hazmat emergency teams and/or firefighting units, and to assist all designated employees, plant workers, safety personnel, engineers and other personnel of risk hazards. 0: Will not burn under typical fire conditions. 1: Does not burn easily; requires extensive exposure to heat before ignition and combustion occur. 2: Must be heated or exposed to high temperatures before ignition occurs. Can release hazardous vapors when exposed to flames. 3: Solids and liquids that are able to be ignited under almost all ambient temperature conditions. 4: Materials that can vaporize at normal pressure and burn rapidly. 0: Materials that do not have hazards upon exposure to fire conditions. 1: Substances that cause irritation upon exposure. Only minor injury is sustained if no treatment is provided. 2: These materials can cause serious injury, during periods of short exposure, unless immediate medical treatment is provided. 3: These substances can affect health or cause serious injury, unless prompt medical treatment is provided. 4: These materials can cause serious injury during periods of very short exposure – even when immediate treatment is provided. 0: Substances are stable even under heat or exposure to fire. 1: Materials are mostly stable, but can become explosive at higher temperatures and pressures. 2: These substances can react violently. 3: These materials are capable of explosive decomposition – but require ignition and can react explosively with water. 4: These substances are able to explosively decompose at normal temperatures and pressures. The NFPA Hazardous Material Storage rating system provides protection, security and warning signals to the general public, emergency personnel, employees and hazmat response teams of the degree of hazards that are possible. US Chemical Storage offers safe, secure, and fully compliant chemical storage buildings for ultimate protection against flammables, corrosives and combustible materials. 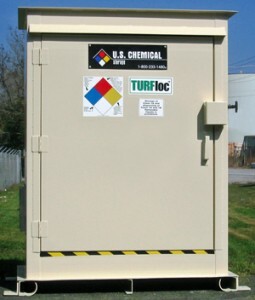 Compliantly store your hazardous materials with chemical storage building by US Chemical Storage.